Reclaim free storage space and get your Mac to perform up to scratch. From corrupted cache to duplicate files and everything in between, MacFly Pro improves Mac maintenance and saves hours of manual storage cleaning. 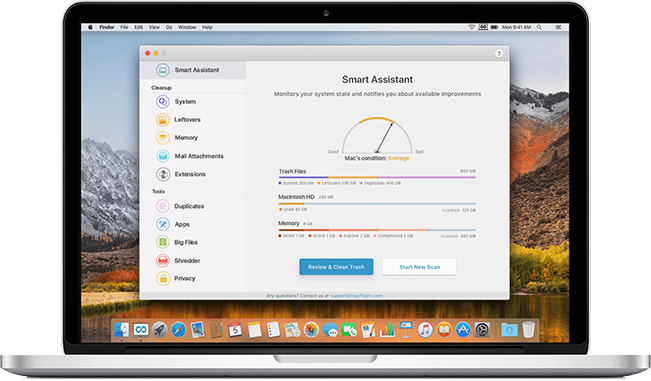 Smart Assistant enables MacFly Pro to adjust cleaning tips and routines according to your Mac’s needs. 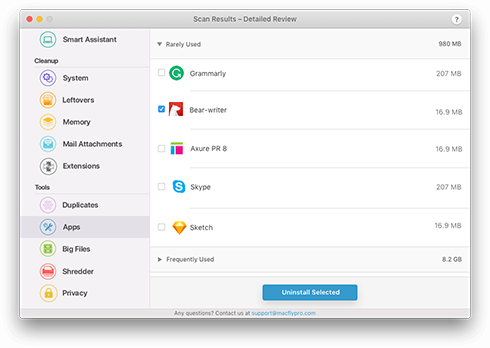 By seamlessly scanning your system Smart Assistant focuses on providing improvement suggestions based on how you use your Mac. What Makes Smart Assistant Indispensable? Built from scratch to ensure consistent stability and performance. 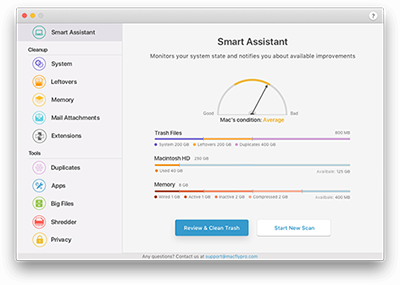 Smart Assistant in Mac cleaner reviews scan results and gives tips. Intuitive and easy to pick up. 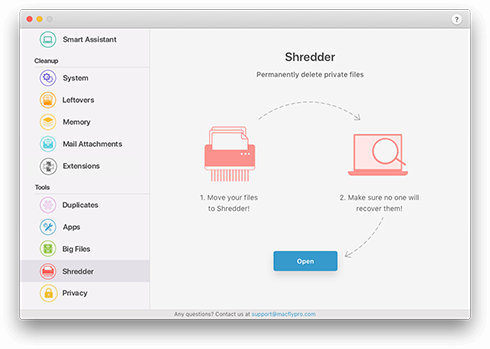 Cleaning of your Mac hasn’t been easier. Solved my storage problems. 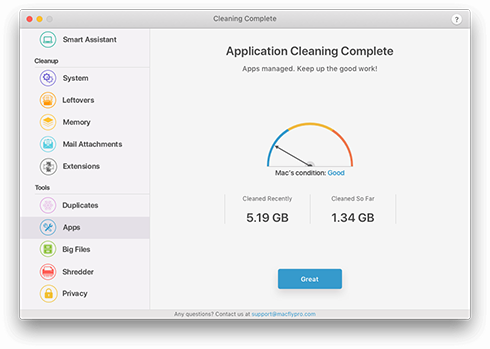 Cleaned over 40 GB of System storage on the first scan, which is the best result out of the Mac cleaning utilities I’ve tried! Not to mention, how impressed I am with the on-point cleaning reminders. Love it! This app is a no brainer! Discovered MacFly Pro when I was searching for a program to clean up Mac. Duplicates were the numero uno issue on my MacBook, but to my surprise they were not the only useless thing that took up space on the tiny SSD. Long story short, I’m so sold on this I’ve subscribed for a year. None of the cleaning apps stood out to me until I tried this app. I use my MacBook Air on the daily and often have no time to properly shut it down or clear out the junk. Smart assistant feature is godsend! Can’t believe no one has thought of this before. There is nothing new about a cleaner, but it was tough for me to find one that’s not costly and good at what it does. Liked it since day one, so purchased the annual plan right away and saved a couple of bucks. When it comes to getting the best bank for your buck, this app is my top pick. Installed this on my parents’ laptops as they always misplace files and end up having tons of copies. It works like a charm. My parents are not exactly ‘techies’ but even they were able to get a hang of it. Great app! I’ve installed macfly pro on my daughter’s MacBook Air (mid 2011) to see if its any good and was not disappointed. It swiftly solved the problem with storage and successfully removed some bloatware that I had no time to deal with myself. Very helpful! You’ve got yourself a customer. Small financial commitment with big returns in efficiency, security and free space. First I had buyer’s remorse and was kind of skeptical, but after using this for over a month it has really grown on me. I don’t ever see myself coming back to manual cleaning. Finally, the spinning beach ball of death is not an issue on my MacBook!!! Thank you from the bottom of my heart! I still can’t believe I had over 30 gigs of temp files. Omg.